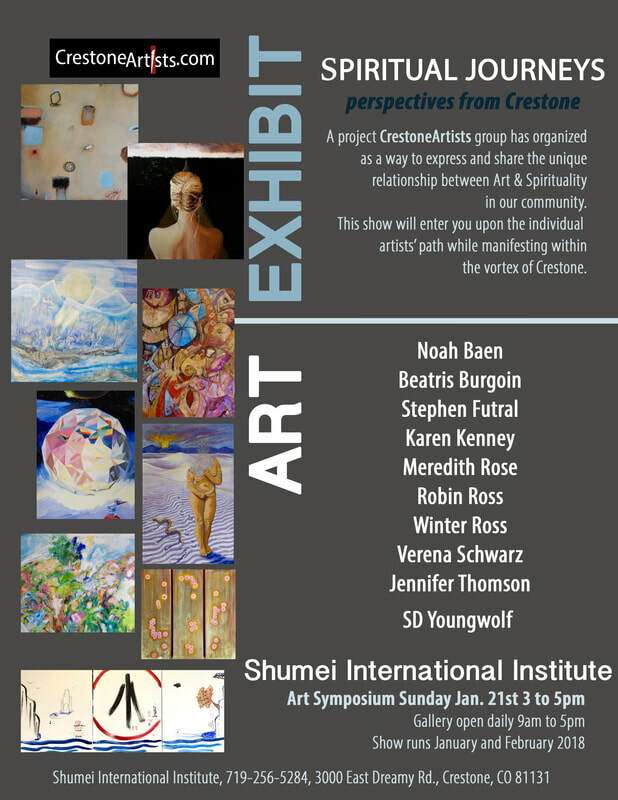 includes work by 16 members of CrestoneArtists exploring art, spirituality and the spirit of a unique place. Crestone, at the base of the Sangre de Cristo Mountains, is internationally known for both it's natural beauty and over 30 spiritual centers. An intermingling of diverse traditions and a vibrant quietude provide inspiration to these artists. Each piece reflects the artist’s’ search for meaning, a universal human quest. Spiritual Journeys is an invitation to deepen sacred relationships with each other and universal energy. All two dimensional work is approximately 30 inches high, including any framing, giving a unity to the installation. Previously shown in Crestone and Salida; Spiritual Journeys will be exhibited in Gunnison in 2019, and in Durango in 2020. Exhibition Coordinators are Noah Baen, Stephen Futral, and Allison Wonderland. SPIRITUAL JOURNEYS, Perspectives from Crestone, a traveling group show featuring work by 16 members of CrestoneArtists, will be on exhibit at the Gunnison Arts Center through May 31st. An opening reception, with live music, will take place Friday, May 3 from 5:00 – 8:00 p.m. 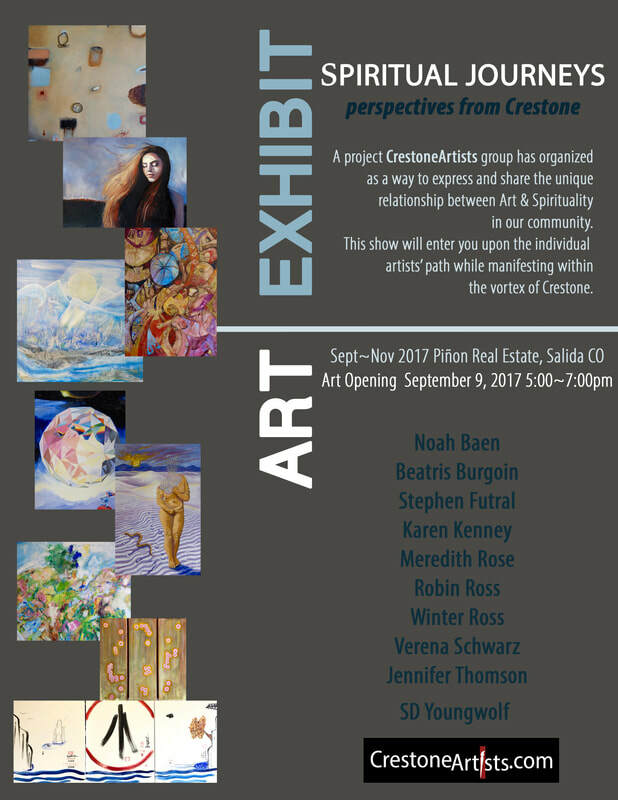 Earlier versions of this exhibit exploring art, spirituality and the spirit of Crestone have been shown in Salida and at Shumei Gallery. The addition of more artists and more works, including sculpture, will make a trip to Gunnison worthwhile even if you saw previous iterations. Help connect the two valleys through art while supporting your local artists. 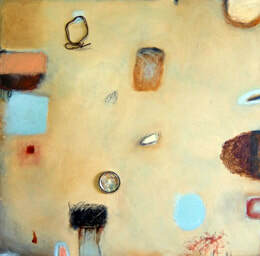 During May the Arts Center will also feature “Efflorescence” oil paintings and mixed media by Molly Darby. Learn more at gunnisonartscenter.org. ​I believe the divine—call it Spirit, Higher Dimensions, God or Goddess –pervades everything within us and around us. For me as an artist, that “something that lives in everything” is most accessible in Nature. The light, spaciousness and beauty of the landscape-- its life force—invite me into a dance of collaboration in form and color that becomes a painting. The painting, in turn, is my invitation to the viewer to enter into his or her own journey with Nature and Spirit and to share the emotions of joy, exhilaration, gratitude, expansion and openness that I have experienced. ​Blue Humanoid in My Tea Is Me? Many Crestone locals describe the town as a place of crystals. In a recent group created comprising Crestonians, a "paradigm shift" was chosen as a priority. The gnome represents other beings helping humans; the mushroom grows in the wild plentifully in the state of Colorado. The eclipse at the top of the painting represents the change on our planet. If you turn the painting upside down, the Crestone skyline (the Sangre de Cristo mountains) are visible. 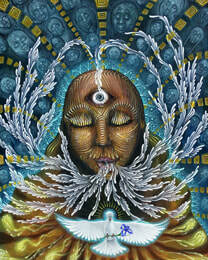 Through my paintings I strive to bring awareness to the unified field. Feeling disconnected is at the root of all of our problems. We have forgotten that we are connected to one another, our environment and the Divine. My art embodies the organic flow of energy that can be observed all throughout life. It’s in the wind, the plants, the animals, our dance moves and anywhere else you look! ​This work springs from the Norse mythology about the over god Oden who watched over the world. He was accompanied by two ravens, “Thought” and “Memory “ who went out into the world daily and reported on its condition. The overarching concern was the condition of the tree of life gnawed on by a great serpent and giant wolf thus threatening the world. I have used this mythology to explore the current condition of our planet using the metaphor of the tree of life, carbon symbols and the messengers of our own thought and memory as we consider our environment and its condition. ​I work in collage because it allows me to stay connected to the miraculous and spiritual side of life. Finding a thread, a piece of paper or a foil wrapper, these earth materials, however processed, are inspiring when they are appreciated for their unique beauty. This piece started with a postcard. The lady is being birthed in a beneficent waterway, a moving flow of energy. Spirituality is to allow, to be in wonder, to be awake to the awe of everyday life which is pinned to the divine under all that we do. 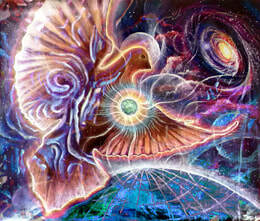 My Dreamscapes/Innerscapes painting series is of a space and time unknown. in the deep woods recently inform my heart-mind and spirit connection. Sumi ink brush work, collages with tissues, torn pieces of my ink paintings, found pieces of paper/cloth, make their way into my art pieces like in streams of consciousness. They form the under layers such as the pentimenti of life processes. I let these markings lead to a connectivity that inspires the formation and completion of the images. ​K'un: A remnant of my hippie days in the 70's when I lived on communes in Mill Valley and Vermont, my tattered copy of the I Ching still inspires me. Hexagram 20, K'uan, has a double meaning: Contemplation is one, and the second, a tower typical of ancient China...these towers, on mountains, served as both a viewing platform and a landmark. My sculpture is designed to shine an overhead light thru the hole onto the small ledge, illuminating a treasured icon. It's a shrine. Cosmic Seed: This came about in the spring of 2016, a nice narrow piece of Italian blue ice alabaster, with steel pegs for visual impact. Guess I was contemplating seeds, spring, the cosmos. "Peace" evolved after a lovely Mexican stone mason whom we met in Baja, Don Manuel, gifted me with this slab of selenite. Don Manuel and his wife run a small coffee shop/museum, south of Ciudad Insurgentes about an hour, on the hill not far from an onyx quarry. Please stop in if you drive down Highway 1, to view his amazing collection of archeological artifacts, have a cup of coffee, buy a shark's tooth, and purvey our blessings...they are getting quite old. He has a giant shark's tooth from a prehistoric shark on display. Good people. ​Art has always been my refuge - a sacred, secret place where I could step out of conceptual mind and explore the world of feelings and alternative realities. Growing up in DC, and later as a student in Paris and London, museums felt to me like places of worship, or sources of nourishment. I’ve spent much of my adult life as an expat, teaching contemplative practice and creative process. Trained as a psychotherapist, I developed a passion for yoga and Buddhist meditation. I’ve lived and worked all over Asia for the past 15 years sharing these tools with others and learning from local artists and healers. Spending so much time in a foreign culture reinforces universal themes of what it means to be human, and also presents a unique view into our differences. In my work, I contemplate these universal themes, and the mystery of human emotion. The visual world mirrors our internal landscape and provides insight into the stories taking shape there. My hope is to show how art helps us connect with something larger than ourselves and encourages us to realize that we are not alone. Both artist and viewer/experiencer are transformed in the interaction. Relationship is born. Though I have been painting my whole life, when I recently discovered encaustic wax medium, my world changed overnight. The nature of the medium allows for a thrilling array of possibilities. ​a moony reality as i paint a stormy desert red with fire. 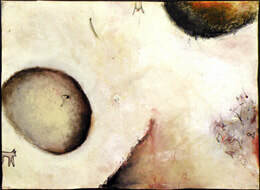 time passes and the paintings change often, from red sand to white and from death to life. from airlessness gasping to a beauty beyond breath. My work usually tells a story, or several at the same time. If you look at "White Sands" awhile you will hear the archetypal stories or maybe a unique one of your own. Ask questions like: "What is the historical legacy of White Sands? Is that burst of light a sunset, sunrise or a mushroom cloud? What things does a serpent symbolize? Does the woman's stance remind you of a renaissance painting? Eve? Venus? Why is she leaving her body? What is her relationship to the snake? What do the tracks in the sand tell you? “MoonSpring” comes from a visionary experience at Valley View Hot Springs. It could be described as a nature spirit in her “church”, offering the magic of the night. As a shamanic practitioner and Pagan, it’s not unusual for me envision the elementals. (see verenaschwarz.com) in a more abstract form, where symbolism that is culturally and historically specific is distilled to universal and time-transcending shapes floating in space. Color is still used according to their vibrational quality and Crestone is yet again the underlying and overarching inspiration for the artistic expression of the spiritual experience and content. "Pathways 2" represents a type of custom work Verena Schwarz has created for friends and family members over the past years. Individual and personalized elements of a (spiritual) life's journey are integrated in a predominantly abstract landscape. Commissions are available upon request. Please contact Verena at verena@verenaschwarz.com for further information. ​The ideal of my art is to create in the viewer the feeling of having encountered something alive; a composition of color and form that is not still, but that lives and breathes and reaches out to invite the viewer to experience its hidden source of life akin to the human heart. ​My spiritual journey is a continuous creative pilgrimage, seeking and sharing meaningful relationships grounded in real time and space. The studio is my temple, artmaking my sacred practice; communing and actively engaging the mysteries through the vitality of the organic materials. This practice requires courage and vulnerability, patience and persistence. It has a life of its own. Although I never know exactly how or when Grace will breathe Her magic into the work, I have discovered how worth it it is, to keep at it in the studio, to be ready for Her. I feel that true art has its own unique lifeforce; imbuing and expressing a vitality that has the power to move our souls. True art affects us, nourishes our need for genuine connection, and continues to inform and enrich our lives long after we've encountered the art. My mythical figures are sculpted from the branches, plant fibers and clays that I have gathered by hand from my local surroundings. These life size works reflect and respond to our human scale and shapes. They stand directly on the ground, inviting intimacy with viewers, welcoming an opportunity to feel the sacred mysteries of fellowship. ​I believe that one of our greatest gifts is the creative imagination, and it is the most important part of my artistic explorations. As an artist, I have been greatly influenced by my Cherokee heritage, my immersion in Indigenous culture, and world travels. My major mediums are oil painting, pastel, gourd art, and mask making. I have shown and won numerous awards at Native American art shows across the country. My hope is that my art will speak to the viewer's sense of wonder and connection with Earth and Spirit.